← Lizard symphysis histology paper out in Anatomical Record. Holliday CM, Ridgely RC, Seldmayr JC, Witmer LM. PLoS ONE 5(9): 15p. Visit the additional media here including a longer narrative, old photos, and the 2001 SVP presentation. Visit Mizzou’s Press Release Page here. Brachiosaurus showing height differences applying Alligator-like CCF. Modified with permission from MJ Wedel. How much cartilage did dinosaurs have in their joints? How well can we estimate it? What significance might articular cartilages have on our interpretations of dinosaur biology? Humerus from 6ft long alligator with cartilage caps removed. Using data from the living relatives of dinosaurs, crocodilians and birds, this study concludes that dinosaurs built their limbs differently than mammals, relying more on cartilage than bone to not only lubricate their joints but also to actually form the articulating condyles and processes that unite and stabilize the knees, elbows, and other limb joints. 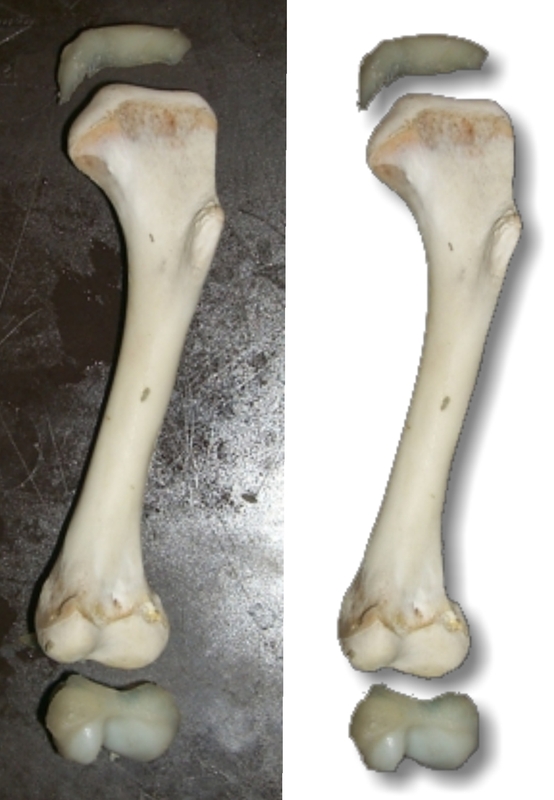 The bony ends of long bones of dinosaurs indicate that blood vessels supplied these cartilages throughout the animal’s growth, thus enabling these cartilage caps to remain far larger than those found in mammals. Modified photo of Brachiosaurus knee. We developed a metric, the cartilage correction factor (CCF) to estimate the amount of cartilage on the ends of long bones. For example applying an Alligator CCF (10%) to Brachiosaurus altithorax, which has a 6ft long femur and about a 4ft long tibia, would add about 1ft of extra cartilage onto the total length of the elements. 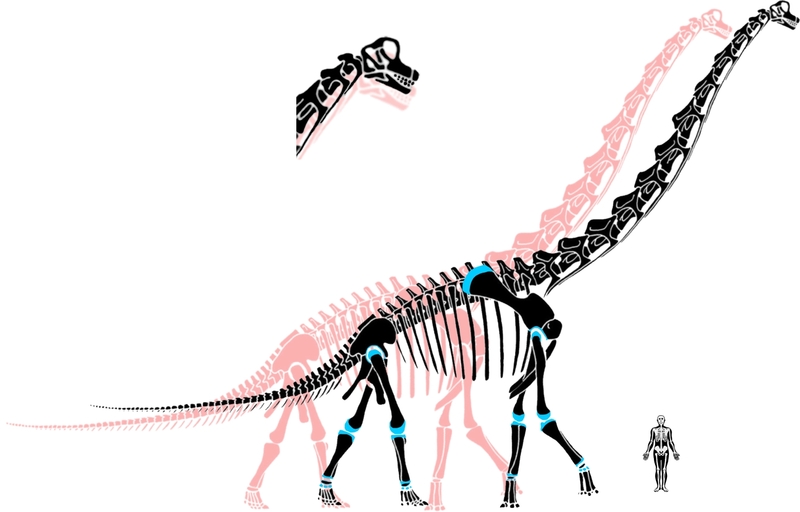 Adding 1ft extra to the height of a fossil taxon, like the 42ft tall Brachiosaurus, may seem trivial; however distributed evenly on all four joint surfaces results in cartilage caps that are 3 inches thick. That’s really thick cartilage! We hope this new metric, the CCF, aids paleontologists with their estimates of height by decreasing the amount of error involved in these reconstructions. However, even though we’re losing length and breadth of these elements upon the loss of cartilage, condyles and other articular structures, the most critical features that account for the fit, or congruency of the joints, and therefore posture are lost. Because posture is difficult to estimate, ranges of motion and eventually estimates of speed and locomotor behavior suffer because of the error associated with articulating, or misarticulating these elements. That said, this is not meant to dissuade paleontologists from studying posture and locomotion, but merely to give them more an anatomical leg to stand on. Funding for this project was provided by National Science Foundation (NSF) DDIG 0407735 (to L.M.W and C.M.H.) and NSF IBN-9601174, IBN-0343744, IOB-0517257 (to L.M.W.) as well as Ohio University Departments of Biological and Biomedical Sciences, Ohio University College of Osteopathic Medicine, and University of Missouri Department of Pathology and Anatomical Sciences. This project has had a long history, and thanks to the encouragement and patience of numerous people, we are happy to finally see it out. Please visit the WitmerLab’s Pick & Scalpel Blog for additional information. This paper was a candidate for the Paleo Paper Challenge 2009 at The Open Source Paleontologist. We almost made it. This entry was posted in Research News and tagged cartilage, dinosaur, epiphysis, locomotion, posture, size. Bookmark the permalink. Congratulations, Casey, to you and your colleagues on a very nice paper. I know it has been a long time coming, and I’m sure this will have important implications for dinosaur morphometrics, locomotion, and so-on long into the future. Your first abstract on this oh-so-long-ago was an inspiration for me to take this issue more seriously. Great job. Fantastic that this work is out — many congratulations to everyone involved, and also thanks for taking on an important and much too frequently overlooked source of inaccuracy in much of our palaeobiological work. One nit: you refer above to the femur and tibia of Brachiosaurus altithorax, but the tibia is not known from that species (see Taylor 2009 for a summary of B. altithorax material). From the colour of the bones in the picture above, I am guessing that you took these measurements from the FMNH mounted skeleton (or the identical one at O’Hare) — that mount does incorporate casts of all the good material from the Brachiosaurus holotype FMNH P 25107, but it fills in lots of gaps, including the tibiae, with casts of material from the related but distinct Giraffatitan. (For more on this mount, see http://scienceblogs.com/tetrapodzoology/2007/06/tet_zoo_picture_of_the_day_12.php). Thanks Mike, the measurements of the elements came right out of the literature, the citation is in the paper (I honestly forget from where at the moment). The photo was just that, a photo I used to show off a knee; no measurements were taken of it. I still think the biology and the findings of the paper are sound regardless of hybrid museum mounts and taxonomic vagaries. Unless of course, the characters defining the two taxa have to do with the amount of cartilage at the ends of their bones. Oh, I didn’t for a moment mean to imply that the results were invalidated! In fact, reviewing my own photos of the O’Hare mount, I am pretty certain the the tibiae of that skeleton (like the radii and ulnae) are not even casts of Giraffatitan material, but sculptures. I see that Brachiosaurus is in any case only mentioned very much in passing in the paper: I am guessing that your numbers were from Janensch (1961) which does describe Giraffatitan (“Brachiosaurus” brancai of his usage), but all the overlapping material of the two animals does suggest that they had very similar limbs. 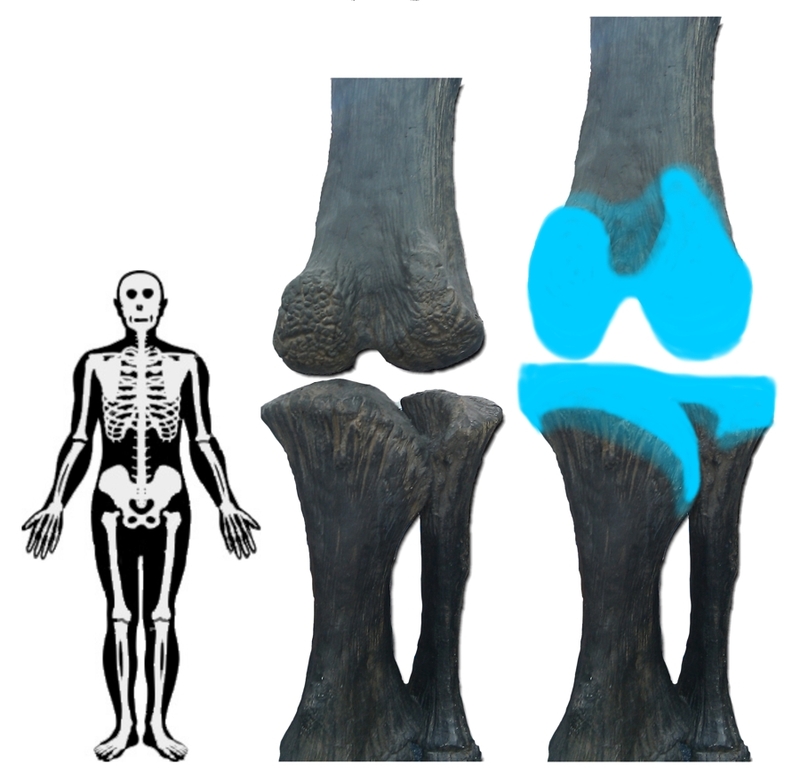 By the way, in connection with this work you might be interested in a talk that I gave in 2005 (and again in 2008 at the German Sauropod Group’s meeting) entitled Upper limits on the mass of land animals estimated through the articular area of limb-bone cartilage. The abstract is at http://www.miketaylor.org.uk/dino/pubs/progpal2005/abstract.html and the slides are linked from there, but the key conclusion was that compressive stress acting on the joint cartilage in Brachiosaurus altithorax could have come uncomfortably close to the limit at which plastic deformation occurs. Although, as the last slide points out, I am confident only that my numbers are accurate within a factor of 756. I feel very stupid that I never got around to working this up into an actual paper.